Dressing up in a black and green dress while casting evil magical spells on the people of Oz to ensure your reign of terror over them might sound a little crazy, but you might do a crazy thing or two when some girl drops a house on your sister. Even the Wicked Witch of the West has a sob story: she was always competing with her sister, constantly overshadowed by her gift of connecting with the people of Oz. When she was finally shown a way to best her sister, she jumped all over it – at the cost of becoming one of the most recognizable villains of our time. When your little girl wears a Wicked Witch of the West costume, it's a little difficult to blame her for all the evil deeds that she'll do, especially when she's channeling all that crazy from the Wizard of Oz character. 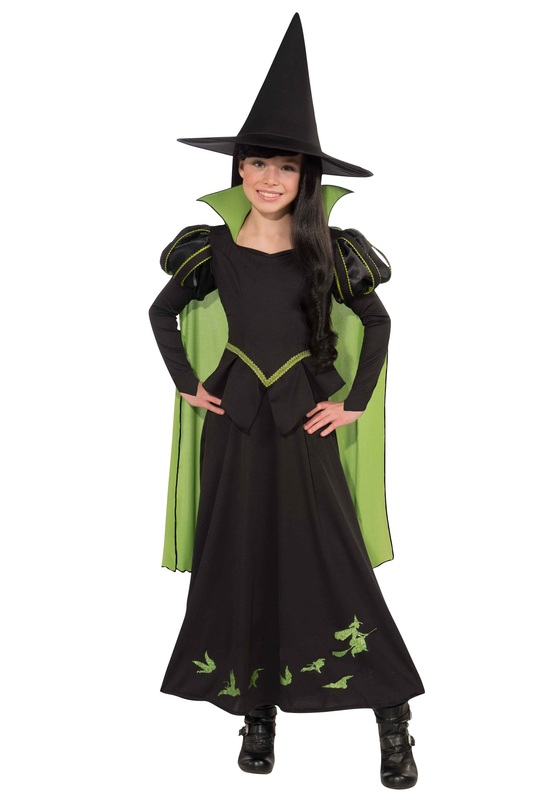 This officially licensed Wicked Witch of the West costume is made of 100% polyester fabrics, so it’s breathable enough to make it comfortable for a full night out trick-or-treating. The black dress has an oversize green collar and secures in the back with a Velcro closure. The matching green cape is sewn to the dress at the shoulders – one less piece you have to worry about losing! This kids costume is full of amazing details such as the green braid trim around the sleeves and the green, glittering flying monkey print along the bottom of the skirt. No witch costume is complete without the traditional black, pointy hat – so it’s included with the costume!